How hard is it to spell "YouTube"? I visited Alexa today and as usual I glanced at the “Movers & Shakers” section to see who’s having a good or bad week. 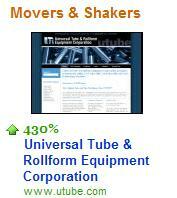 To my big surprise the top mover (upwards) was something called “Universal Tube & Rollform Equipment Corporation“. I was puzzled until I saw the domain name: utube.com .. haha. lol (yes, a real laughing out loud). No way is this many people trying to reach someone who “offers wide selection of used, rebuilt, and new equipment for the tube, pipe, and coil processing industries” — these people are looking for youtube of course. Check out the traffic spike around the Google / YouTube deal .. it’s probably people who have heard it on the news or something, and don’t know how to spell it.